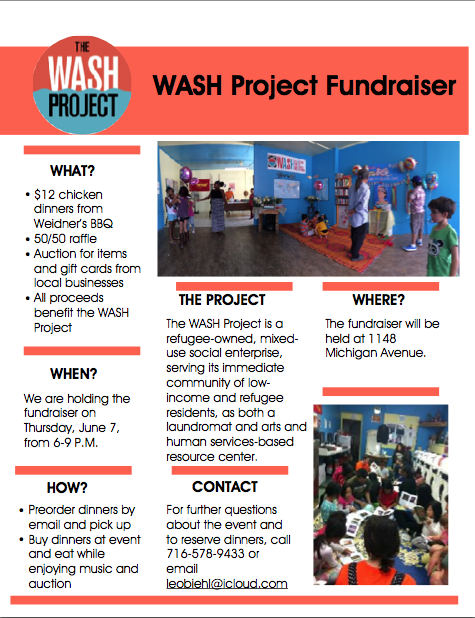 A couple inspired students from a local high school are determined to make a difference and have gone all out to throw an ambitious fundraiser for The WASH Project on Thursday June 7th at cool little venue on Michigan Ave. near Best St. There will be 100 chicken dinners for the taking. Feel free to order in advance, or at the event. Donations are also welcome of course if you can’t make the event. To order/donate, please contact Leo Biehl at leobiehl@icloud.com or 716.578.9433.